Pssst! We have exciting news for WeAllSew fans! Guess what? 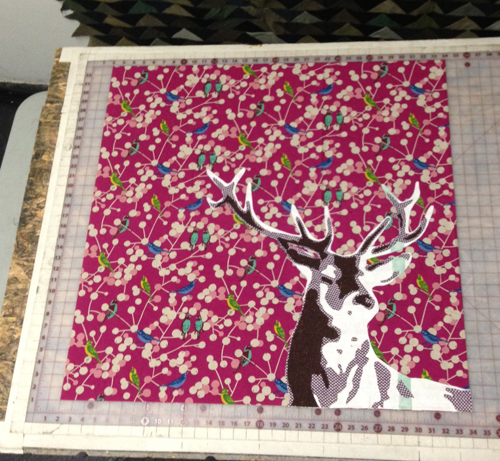 Luke Haynes is going to show us how to make this fabulous deer quilt right here at WeAllSew.com! Our new WeAllSew Expert LUKE promised to share some fun projects with you here on WeAllSew. After sharing helpful tips on cutting and piecing, LUKE will now show us how to make this awesome deer quilt featuring his signature portrait quilt technique. And, he’s sharing his technique exclusively with WeAllSew fans! When? The quilt series starts September 23, 2013. Be sure to check in on Monday for Part 1. Of course, we’ll want to see what you stitch up, so we’ll create a Deer Quilt Pinterest board just for this sew-along. Share your personal deer quilt with us when you’re finished for chance to win fun fabrics and tools. Next Next post: Meet you at Sewing Summit? I just saw this on instagram and will be back on monday to check it out – looks awesome! luke’s work is unbelievable – i love it!!! can’t wait. Totally stoked about this! Can’t wait to jump on without a life preserver!